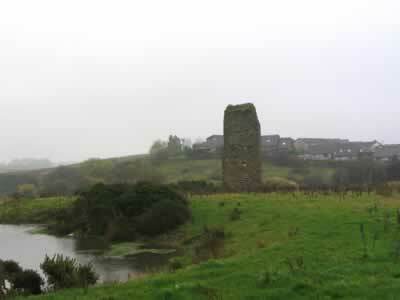 Corsehill Castle was originally a 12th century fortification, founded by Godfrey de Ross. Standing on the west bank of the Clerkland Burn, by the 16th century the Cunninghame's of Kilmaur family had founded a L-plan tower house on the site. In 1608 the castle was known as Reuincraig because of its decay state but the site is often confused with Corshill Mansion, which stood on the eastern bank. By 1840 the castle was so modernised, it was difficult to realise that it had been a ruin but by the late 19th century it was a very ruinous mansion. The remains stand on a platform and consist of irregular-shaped banks, a single fragment of high wall, with a eastern fireplace and other small fragments of masonry. The platform is encased by a wide ditch, a northern natural gully and an eastern outcrop of rock, which is now partially covered by the railway embankment. A mile south at Stewarton is Law Mount and 12 miles north at Paisley is Stanely Castle. Corsehill Castle is located north of Stewarton, off the A735. 7 miles north of Kilmarnock, on the A735.